I suppose you want to get to know more about me. Here you are. 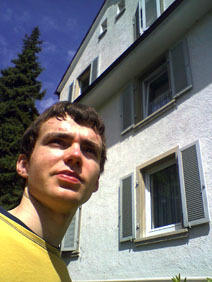 I am Dominik Bok and currently living in Western Germany (NRW). What do you do at the computer and how did you start? Since the age of nine I have been interested in technics and computers. I also gained my first experiences with programming during this time. At the moment I create websites, design small software and am interested in reverse engineering (crackmes) and assembler. In addition to my hobby programming I like to play tennis, go skiing in winter and to sail on the Lake of Constance (laser) and I am an enthusiastic amateur radio operator (call sign: DL1RSF).